Select the rule(s) you need for the current task from an extensive set of pre-defined rules. Each rule has its individual settings. Renaming tasks can be implemented clearly with a minimum of efforts. Defined rules set can be stored and later load. The possibility to deactivate individual rules increase the flexibility and function variety. Rules position in a set can be changed with ease. · UPPERCASE, lowercase, Capitalize, etc. · Add, rename, delete file extensions. · Search and Replace/Remove string. · Processing of tags from audio files of the formats MP3, Ogg/Vorbis, FLAC and WMA. · Processing of header informations from saved e-mail files. · Evaluation of the EXIF data of digital photos. · Using of descriptions of various document types over WDX Plugins. · Rename group of files using a name-list CSV file. · Rename group of files using a name-list text file. · The Windows Explorer like interface offers an optimal overview on the entries. · Clear, easily understandable definition from simple to complex renaming rules with a multiplicity of options. Rule sets can be stored and loaded later again. · Complete real time preview of the new file names before renaming including error recognition with name conflicts. · Undo the last renaming operation. · Recursive processing of subfolders and the files contained in it. · Filter function for the restriction of the files on the basis of various criteria. · Integration of external description Plugins in the WDX format written by third parties. · Export of file lists in different formats. You cannot download any crack or serial number for EF Multi File Renamer on this page. Every software that you are able to download on our site is legal. There is no crack, serial number, hack or activation key for EF Multi File Renamer present here. Our collection also doesn't contain any keygens, because keygen programs are being used in illegal ways which we do not support. All software that you can find here is freely downloadable and legal. 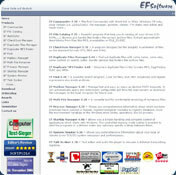 EF Multi File Renamer installation package is prepared to be downloaded from our fast download servers. It is checked for possible viruses and is proven to be 100% clean and safe. Various leading antiviruses have been used to test EF Multi File Renamer, if it contains any viruses. No infections have been found and downloading EF Multi File Renamer is completelly problem free because of that reason. Our experts on malware detection tested EF Multi File Renamer with various spyware and malware detection programs, including fyxm.net custom malware and spyware detection, and absolutelly no malware or spyware was found in EF Multi File Renamer. All software that you can find on our servers, including EF Multi File Renamer, is either freeware, shareware or open-source, some of the software packages are demo, trial or patch versions and if possible (public domain licence), we also host official full versions of software. Because we want to be one of the fastest download sites on the web, we host all the software including EF Multi File Renamer on our servers. You cannot find here any torrents or download links that would lead you to dangerous sites. Rate EF Multi File Renamer 2.30!